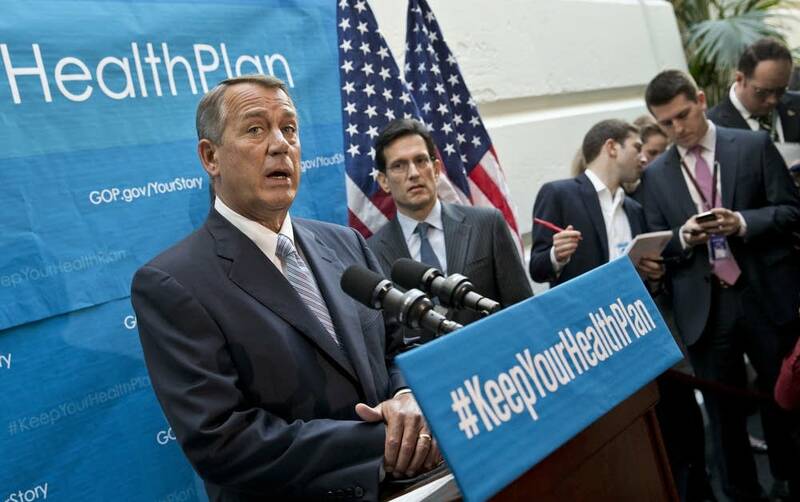 Listen 'Obamacare' only a temporary burden for Democrats? The Republican political machine is trying to capitalize on Americans' opposition of the Affordable Care Act by targeting ads at Democrats, including Minnesota DFL U.S. Reps. Rick Nolan, Tim Walz and Collin Peterson. Even before it became law in 2010, most Republicans opposed the Affordable Care Act, and their complaints about "Obamacare" have resonated with many people. A recent Real Clear Politics compilation of polls shows nearly 53 percent of Americans oppose the law. "If you were going to guess today, you would say that Obamacare is going to be a significant burden for Democrats," said Larry Sabato, University of Virginia political scientist. But that could change, said Sabato, so it's premature to predict that hammering Democrats over Obamacare will be a winning strategy for Republicans in 2014. "People need to remember a couple of months ago during the shutdown most analysts were saying that Republicans had blown their chance to win the Senate and could even lose a substantial number of House seats," Sabato said. "Well, that's all gone because of the failure of Obamacare." While bashing the Affordable Care Act might be popular now, the strategy might backfire once the program is entrenched. Consider Medicare and Social Security: Both were controversial initially. Franklin Roosevelt signed Social Security into law in 1935; Medicare became law in 1965 under Lyndon Johnson. In the case of Medicare, there was widespread fear the program would overwhelm hospitals with new patients, shutting out others, said Stephen Mihm, associate professor of history at the University of Georgia. Many doctors threatened to boycott Medicare and southern hospitals initially refused to integrate under the program. "In certain respects Obamacare's rollout has been more problematic in so far as we have problems that didn't exist in 1965, like websites for example, that don't register people," said Mihm. "But in other respects, the rollout out as it initially took place was greeted with a considerable amount of skepticism as to whether the program would actually work as planned." In their effort to move beyond the public relations nightmare of Obamacare's rollout, Democrats are pointing to a repaired website and highlighting popular benefits of the health care overhaul. "I look forward to the campaign and the future and making that case," said DFL Sen. Al Franken, who's up for re-election next year. Franken said he "absolutely" believes he'll be able to successfully campaign on the message that Obamacare isn't the disaster Republicans claim. "My job is really to fix things as they go and to make sure that we don't go back to an America where people can't get insurance because they have a preexisting condition, where people are one diagnosis or an accident away from going bankrupt," Franken said. "We can't go back to that system." While Obamacare is certainly a big problem for Democrats now, it is only part of a larger challenge facing Democrats, said political observer Sabato. President Obama's approval rating plunged into the upper 30s last month, the lowest of his presidency. If Democrats can't turn that around they'll be in trouble next year regardless of what happens with the Affordable Care Act, he said.